I went on an Ipoh eating spree with some friends not too long ago. Our first stop was Thean Chun for brunch. The Ipoh Kuey Teow here is not to be missed! Prices are not cheap; I think a large bowl costs RM4.50. Nonetheless, they did not skimp on ingredients. The shrimps were fresh and sweet while the chicken strips were lusciously tender. The rice noodle (kuey teow) was silky smooth and the soup was both sweet (from the prawn stock) and savoury. It was every bit delicious! 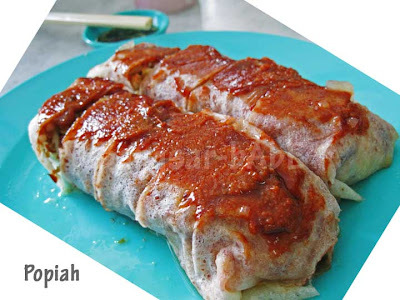 The popiah here is pretty good too – we ordered two pieces to share. Nicely wrapped and slathered with chili sauce, it was bursting with ingredients. I like the addition of dried shrimps in the filling – it gives the popiah a nice bite. Since there were 5 of us, we ordered plenty of food. 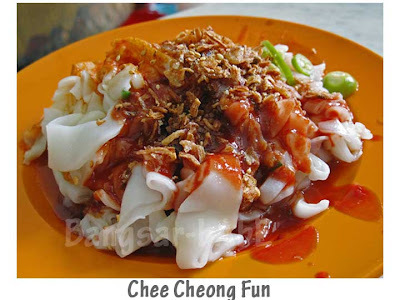 The chee cheong fun was delicate yet chewy and light. It came topped with lots of freshly fried shallots and pickled green chilies. As nice as the texture was, I still prefer Penang’s version (with prawn paste) better. The 5 of us polished off 60 sticks of pork satay! 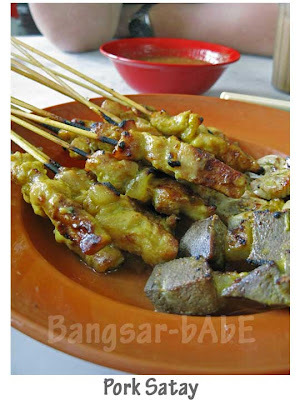 Besides pork satay, they serve offal satay as well. Only rif ate the offal satay. I don’t like its rubbery, chewy texture. The pork satay was tender, smokey and well-flavoured. rif and I however, feel that Malacca’s version is slightly better. Since we arrived at 11am, their famous crème caramel was sold out. I was very disappointed as I was looking forward to eating it. So I told the gang we were coming back the next day…at 8am! 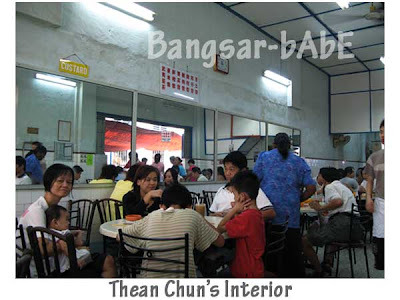 Aiyor…your post makes me crave for all that this Ipoh signature Old Town kopitiam offers! Must go back to Ipoh soonnn! i dont think the pork satay in malacca is slightly better but A LOT better!!! My favourite stop in Ipoh. 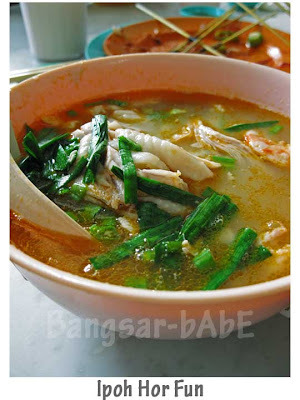 I love the Ipoh Hor Fun too..the soup is so yummy! looking at the hor fun pics makes me miss ipoh hor fun so much! rif – I think it's nicer, but not A LOT nicer. You're biased la! One of the most satisfying simple pleasures Ipoh has to offer. I just came across your website and now seem to have my tongue permanently affixed to my monitor (makes typing difficult). The food you describe and photograph looks fantastic, and it took me about 1 second to open a new window on my computer and look up a recipe for popiah. Malaysian food is my favorite! Thanks for posting this. Thean Chun’s Kai Si Hor Fun’s almost legendary. best I’ve tasted so far, albeit some Ipohans may protest that statement. The creme caramel’s nothing major, but a classic dessert after the OILY meal of satays, popiah and CCF. the CCF with curry pig’s skin’s the best. 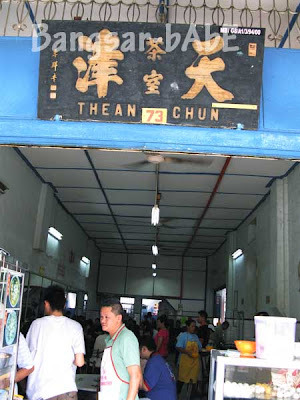 Got any place selling better hor fun than Thean Chun meh? CCF with curry pig’s skin?? I must try that the next time!